First off, thanks to everyone who commented on last month’s blog posts. 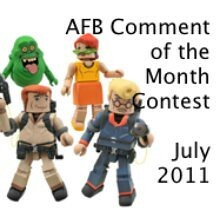 Congratulations to AFB Forum Member super-duper-toybox for being our randomly selected winner this month - I believe he is a repeat winner too! Once we hear from s-d-t, his choice of either the DC Universe Classics Wave 17 White Lantern Hal Jordan or the Marvel Universe Doctor Strange figure will be on the way when available from Mike’s Comics N’ Stuff. 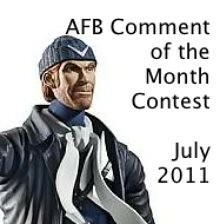 Now to July’s Contest: on offer are two great prizes, either the Real Ghostbusters Minimates Series 1 or the Captain Boomerang figure from DC Universe Classics Wave 18! OMG! I totally missed that- I just ordered some stuff from Mike too, LOL :D Thank You, Thank You! The Bowen Designs M.O.D.O.K. Full Size statue looks sweet! If only I had unlimited funds and display space!